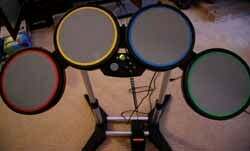 Probably because of the PS3's more open platform, the USB drum kit is automatically recognized in Windows. And with a little midi mapping, you can be rocking out in minutes. Verdict: if you want the Rock Band drums on your PC, buy the PS3 version.